“Taschner was born in Krnov, Czechoslovakia, of Moravian origins. After studying with his grandfather, he played Mozart's Fifth Violin Concerto at his début in Prague, when aged only 7. He studied with Jeno Hubay in Budapest 1930-32, and with Bronislaw Huberman and Adolf Bak in Vienna. At age 10, he played three concertos with the Vienna Symphony Orchestra under Felix Weingartner. By age 17, having undertaken tours in the United States and Germany, he was concertmaster at the City Theatre of Brno. In 1941, still aged only 19, he was chosen by Wilhelm Furtwängler as Concertmaster of the Berlin Philharmonic, while also forging a solo career. He attracted immediate attention, and his portrait was used on advertisements for the orchestra's upcoming programs. In the dying days of the Second World War, the sacked German munitions minister Albert Speer devised a plan to protect the players of the Berlin Philharmonic from the invading Soviet forces. They would play a concert under Robert Heger and then be whisked away to a safe location out of Berlin. 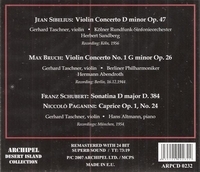 Gerhard Taschner played the Beethoven Violin Concerto. At the end of the concert, however, the players voted to remain in Berlin, in solidarity with their patrons, who were unable to escape. However, Taschner left in a car driven by Speer's chauffeur, taking with him his wife, two children, and the daughter of another musician. They took refuge in Thurnau. From 1946 to 1950 he lived in Rüdesheim am Rhein. After the War he joined the pianist Walter Gieseking and the cellist Ludwig Hoelscher in a celebrated piano trio. He also played the violin-piano repertoire with Gieseking and Edith Fernadi and the concerto repertoire under conductors such as Karl Böhm, Georg Solti, Joseph Keilberth and Carl Schuricht. He was mainly responsible for making Khachaturian's Violin Concerto in D minor known in Germany, having had the score made available to him by the Soviets. In 1947 he made only the third recording of the work, after its dedicatée David Oistrakh in 1944 and Louis Kaufman in 1946. Wolfgang Fortner dedicated his Violin Concerto to Gerhard Taschner. He premièred it in 1947 and went on to become its greatest champion. Fortner also dedicated his Violin Sonata to Taschner. In 1948 Taschner played the Dvorák Violin Concerto in Vienna under Leonard Bernstein, who declined to invite him to the United States at that time. His personal nature was difficult and uncompromising, often leading to irreparable rifts with students, peers and others. He had very strong and inflexible ideas which sometimes put him at odds with conductors and composers. In 1944 he suggested to Jean Sibelius that the final movement of his Violin Concerto in d be played more slowly than the composer had indicated; a suggestion not taken up by Sibelius. During a rehearsal in the late 1940s, he and the conductor Herbert von Karajan were unable to agree on some matters of artistic interpretation, which led to Taschner storming out of the rehearsal and refusing to play the concert; the two never played together again. In 1950 Taschner was appointed a professor at the Musikhochschule in Berlin. He also concertised internationally; in South America he was dubbed ‘the Manolete of the violin’. In Europe, he was seen as the successor to Adolf Busch, Huberman and Fritz Kreisler.